The lovely folks at Crofters Organic sent me 4 different spreads to review. Morello Cherry, Raspberry, Mango and one of their North American Super Fruit. 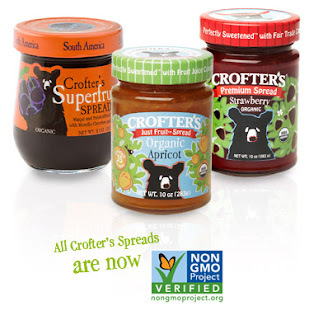 Crofters Organic spreads are GMO free. Organic Morello Cherries, Organic Fair Trade Cane Sugar, Natural Apple Pectin, Ascorbic Acid (vitamin C) and Citric Acid. I had company at the time and the most common statement between all of us who tried the various spreads were how earthy and natural everything tasted. It was fresh and the chunks of fruit were a pleasant and well received surprise. The Mango fruit spread was my favorite even though all of them were delicious. I really like the super fruit, in taste and concept. I think making a spread out of the super fruits and berries found in specific regions and naming them with appropriate names to suit their regions is a wonderful way to taste the corners of the earth. While I was on the companies website I noticed that they had a page of recipes posted online. You could make full meals by slow cooking the meat and spreads. This was a very interesting idea. I cooked some pork in the Morello Cherry Premium spread with onions and then made a gravy out of it afterwards. I really didn't know what to expect. Not only was the idea of cooking a main course with a fruit spread a little strange to me, I opted to create my own recipe as well. 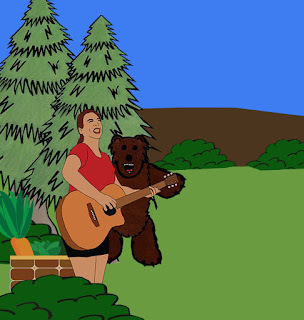 I spooned some over some Rice of the Prairies and was quite surprised with how good it tasted. Not only are the spreads delicious but my experience with Crofters Organic in general has been very pleasant. Disclaimer: I received a few jars of Crofters for the purpose of this review. I received no additional compensation. All opinions are my own and are based upon my personal product experience. Your experience may differ.